LANSING, Mich. — State Sen. Mike Shirkey has been named a recipient of the Michigan Manufacturers Association (MMA) Legislator of the Year Award. The MMA honored Shirkey for his strong leadership in working to improve manufacturing’s competitiveness through health care reform. The Legislator of the Year recipients were honored at the 2016 MMA Legislative Reception last week at the MMA Headquarters in Lansing. The ceremony was attended by manufacturers, legislators, executive branch officials and manufacturing champions and partners from across the state. 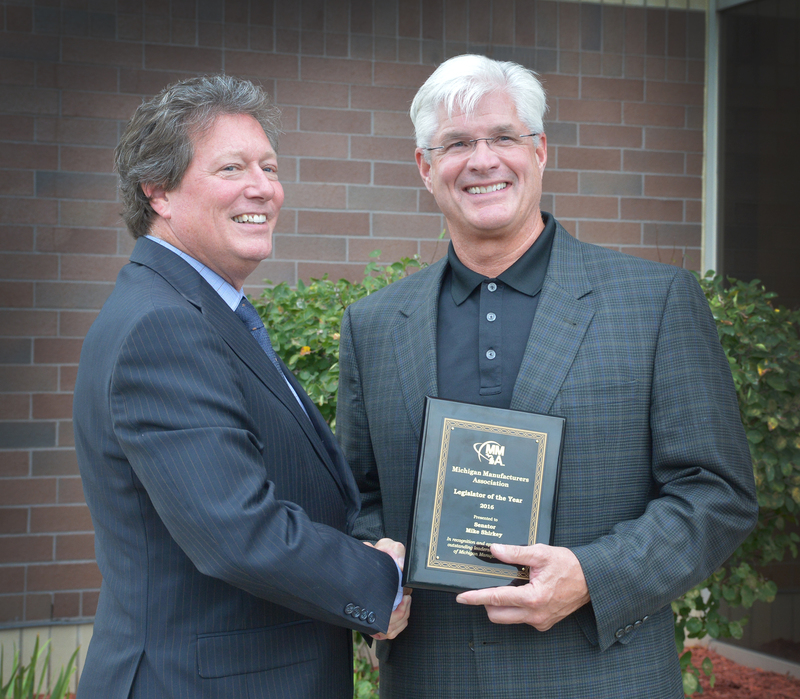 Photo caption: State Sen. Mike Shirkey, R-Clarklake, receives a 2016 Michigan Manufacturers Association Legislator of the Year award from MMA President and CEO Chuck Hadden on Tuesday, Sept. 13. Click the image for a full-resolution version of the photo.